WHAT: The Cabinet of Dr. Caligari is huge in cinema history and in my own personal history with cinema. It's frequently (incorrectly) cited as the first horror movie, and its iconic imagery has been borrowed shamelessly by other filmmakers from the silent era to Tim Burton and beyond. 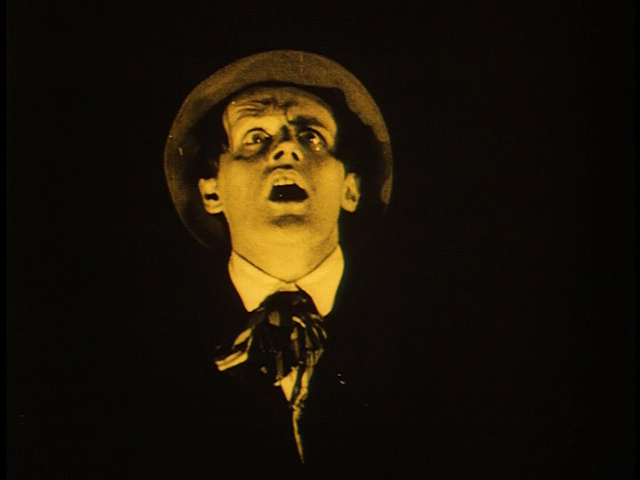 With few of its director's other films available for view, it generally frustrates auteurists, especially those highly influenced by the theories of realism put forth by the influential French critic Andre Bazin, who labeled Caligari a "failure" under his criteria for worthy photographic art. When I first became interested in exploring silent film history many years, ago, The Cabinet of Dr. Caligari was one of the first films from the era that made a very strong and immediate impression upon initial viewing. Though I was watching a rather muddy VHS transfer, I loved what I saw, and became a little obsessed. I read about every article or book I could find about it (including David Robinson's excellent monograph), purchased an 8mm print on ebay (my first and ever such purchase, even though I didn't have a projector at the time) and even dressed as the somnambulist for Halloween that year (immortalized in a photograph I've recently cycled in as my twitter avatar). WHY: Since my first viewing I've taken a few opportunities to see the film when it's screened in local cinemas (which happens less often than you might expect, actually), and have seen it projected from an even muddier video transfer at the Castro accompanied by the local ensemble Club Foot Orchestra, and have seen a 1950s-era retitled 35mm version at the Pacific Film Archive with Judith Rosenberg at the piano and accompanied by a lecture by film scholar Russell Merritt, who has just joined the board of the Silent Film Festival. None of these viewings, or of the DVD viewings I've also experienced in the interim, have been afforded use of a new 4K sprucing of the best original elements. This version premiered in Berlin earlier in 2014, and tonight is the US premiere. It's also the first time I'll be able to view a 4K digital file projected through the Castro's recent acquisition, a 4K projector to replace the 2K one they've had for several years and which had recently developed an "undead pixel" problem (which is even scarier than it sounds). Although I wish the Murnau Foundation would have made a 35mm print available of this new restoration, I'm curious to see what 4K projection at the Castro might look like when applied to a classic film that I'm very familiar with. Tonight's screening is the capper to a full day of Silent Film Festival shows, the entirety of which have been enthusiastically rounded-up by my friend Michael Hawley of the film-415 blog (which I hope he never has to change to film-628). 35mm screenings for this all-day even include the 11AM program of Laurel & Hardy two-reelers, and the 7PM showing of Buster Keaton's The General with live musical accompaniment by the Alloy Orchestra (who last performed this at the Castro in 2004- I was there and was very impressed by how a percussion-heavy score helps amp up the action-adventure elements of the classic Keaton comedy.) The Alloys' 3PM world-premiere presentation of their new, years-in-the-making score to Rudoph Valentino's allegedly best film Son of the Sheik will be sourced from a DCP, as will the BFI's A Night in the Cinema in 1914 show. HOW: The Cabinet of Dr. Caligari screens as a 4K DCP, with live music by the versatile keyboardist Donald Sosin. I've heard his eerie score for the Kino DVD and am very interested in hearing how he transforms it in a live environment. WHO: Alec Guinness, the versatile English actor who would have turned 100 earlier this year if he were still alive today, stars in this film directed by Carol Reed. Guinness is brilliant as an expat whose desire to provide a better life for his materialistic teenage daughter (Jo Morrow) leads him to set aside the vacuum-cleaner biz and accept a gig as a British secret agent. Thing is, he'd rather just sip daiquiris than engage in espionage, so he fakes his way, with luck and imagination, into being "the best agent in the Western hemisphere." WHERE/WHEN: Today only at the Rafael Film Center at 4:30 & 7:30. WHY: Our Man in Havana screens as part of a seven-title centennial Guinness tribute that's been running each Sunday since August, and which winds down the next two weekends with new DCPs of his Ealing comedies The Man With The White Suit and The Ladykillers. Of course the irony of Guinness's legacy is that he's by far best remembered for a role he frequently voiced his disdain for, that of Obi-Wan Kenobi in George Lucas's original Star Wars and its two immediate sequels. Though these films have been left out of this mini-series, fans of Guinness as Kenobi will be able to see him on an even bigger Marin County screen on Monday, October 6th, when The Empire Strikes Back (or the 1997 revision thereof, to be precise) is brought to the Cinema Corte Madera by the Mill Valley Film Festival (MVFF). This is one of the many surprises the MVFF program had in store when last week it revealed the full program for its 37th edition, to be held in Mill Valley, San Rafael, Larkspur and Corte Madera from October 2nd-12th. The longest-running and highest-profile of Frisco Bay's "general interest" film festivals outside of the San Francisco International Film Festival, MVFF has built loyal audiences through employment of a successful formula over the years: securing Northern California (and sometimes West Coast or even U.S.) premieres of several major end-of-year awards "hopefuls", most with acting and/or directing talent expected in attendance, bringing a healthy selection of documentaries and unsung independent films, many with local ties, choosing foreign-language films fresh from Cannes and other festivals, and filling out the program with shorts, retrospectives, and the annual "Children's Filmfest" within the main festival. Lincoln Spector of Bayflicks has written a good first overview on his site, and I plan to write more soon myself. In the meantime, look at the list of MVFF films at or near RUSH status for a sense of what tickets to buy in advance if you're thinking of attending this year. HOW: It's rare for the Rafael to screen 35mm prints these days, but they still have the capability, and will be utilizing it to screen Our Man In Havana. The next print scheduled to play there is of Yoji Yamada's award-winning follow-up to last year's wonderful MVFF selection Tokyo Family, entitled The Little House, which is the only 2014 MVFF title expected to unspool in 35mm. WHO: Documentarian Mark Kitchell, whose most recent release was last year's environmentalism doc A Fierce Green Fire, co-wrote and directed this. WHAT: Berkeley In The Sixties is a well-crafted, aesthetically conservative film about leftists, radicals, and other key figures in the 1960s social protest movements that have been so strongly associated with the East Bay city's public image ever since. For those of us who know this period only second-hand, it's a concise primer on far-ranging subjects like the Free Speech Movement, Anti-Vietnam War protests, "Hippie" counterculture, the Black Panthers, and the battle over People's Park. Made when the events were 20-30 years old (imagine, as a parallel, a documentary on the final ten years of South African apartheid released today), its interviews with 1960s activists show a remarkable candor about the relative strengths and weaknesses of their own protest tactics, frozen at a pre-Clinton-era moment. It would be interesting to know if the interviewees (including Susan Griffin, David Hilliard and Frank Bardacke) would have similar things to say today, now that the term "Free Speech" has been appropriated by the Right to mean "money". At any rate, this nearly quarter-century-year-old film has yet to be superseded by another documentary on these topics, as far as I'm aware. In addition to interviews, Berkeley in the Sixties is constructed of often astonishing archival footage, collected from from rarely-seen films from the period, some by names as well-known as Agnès Varda, David Peoples, Irving Saraf, Lenny Lipton, and Will Vinton. Although I found it odd that Scott Bartlett's 1972 work OffOn was used to illustrate the visual component of a March 1966 Jefferson Airplane concert thrown by the Vietnam Day Committee and later denounced by then-gubernatorial candidate Ronald Reagan. The first several archival clips used are not from Berkeley at all, but from early 1960s San Francisco protests that are said to have laid the foundation for the galvanization of UC Berkeley students to fight for freedom of speech on their own campus. The image above is from a remarkable anti-HUAC protest in San Francisco's City Hall in 1960. WHERE/WHEN: Screens 7PM today only at the Pacific Film Archive. WHY: Tonight's screening, which will be attended by filmmaker Kitchell as well as Frank Bardacke and other activists from the era, launches an important series at the Pacific Film Archive that will last until the end of next month. Entitled Activate Yourself: The Free Speech Movement At 50, this series collects a diverse array of rarely-seen films that together aim to paint an essential portrait of the Bay Area's political roots from a half-century ago or so. Tuesday, September 23rd's show highlights films from the San Francisco Newsreel media collective, as well as Desert Hearts director Donna Deitch's early PP1, which sounds irresistible from the PFA's description to this Steve Reich & John Cage fan. October 9th's Sons and Daughters is one of the especially obscure films whose footage is borrowed for Berkeley in the Sixties: extremely charged documentation of protesters trying to convince young military recruits to turn away from the Oakland Army Terminal where they're being processed on the way to Vietnam. October 14th's program features two sub-feature-length documentaries made by filmmakers with a very different viewpoint from that of the anti-HUAC protesters shown in the image above, and will be contextualized by a UC Berkeley law professor following the screenings. Most of the series films are from the era itself, but KPFA On The Air by Veronica Selver (who was the editor of Berkeley in the Sixties) is a portrait of the broadcasting fulcrum of politics and culture released 51 years after the station first went on the air in 1949. It screens October 26th with Norman Yamamoto's Second Campaign. Finally, the series ends with the sole non-documentary of the set, Art Napoleon's The Activist, shot on the cheap in Berkeley and released with an X rating the same year as Midnight Cowboy was. Although this series is certainly of interest to cinephiles and political history buffs from across Frisco Bay, not just Berkeley, most of its films do focus on that city. San Francisco gets its own spotlight in a perhaps-complimentary Yerba Buena Center for the Arts series showcasing activist-oriented films shot on this side of the Bay. Starting October 2nd, canonized independent classics like The Times of Harvey Milk and Chan is Missing rub up against lesser-known films documenting Frisco's key communities, such as Take This Hammer featuring James Baldwin on a visit to Hunter's Point (showing free October 26th) and Alcatraz Is Not An Island, about the "Urban Indians" who occupied the former prison, future tourist trap in November 1969. I'm especially excited by the 16mm screening of Curtis Choy's 1983 The Fall of the I-Hotel, which documented the destruction of the last remnant of a now-almost-forgotten neighborhood known as Manilatown. I've been wanting to see it for years, and I hope to be there among an intergenerational audience of activists and cinephiles, historians and tech workers, landlords and tenants, SF natives and newcomers, all realizing we need to come together to look at this city's past if we're going to understand how to prepare for its future. WHO: Kathleen Quillian made this short animation. 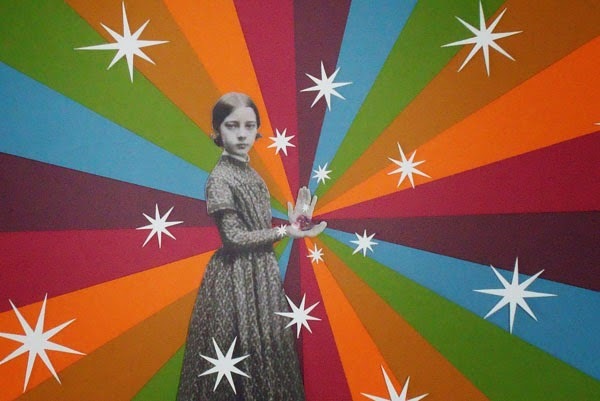 Quillian has a sharp eye for creating arresting, off balance visual compositions, and for using simple visual elements to create the sense of wonder and strangeness which permeate turn of the century writings on the occult and the longing to make contact with the supernatural. WHERE/WHEN: Screens on a program starting 8PM tonight at Artists' Television Access. WHY: This month marks the 30th anniversary of Artists's Television Access, or as it usually nicknamed, A.T.A. The venue is celebrating by hosting a panoply of special events this month (and beyond), starting with tonight's "Open Screening" program of work made by current or former A.T.A. staffers including Dale Hoyt, Claire Bain, Mike Missiaen, Karla Milosevich and more, put together by filmmaker Linda Scobie. She writes, "this show is a wonderfully varied mix of the diverse community involved with A.T.A. over the years and a unique experience to see all their films showcased together." There are too many events at the space for one person to see. Or are there? A gauntlet has been thrown down to endurance-testing cinephiles with a 30-hour marathon screening of films selected by members of the A.T.A. community (also including Quillian and sound artist Gilbert Guerrero, her collaborative partner on Fin de Siècle and on running the Shapeshifters Cinema in Oakland). It starts 1PM tomorrow, and it's possible to see everything for as little as $1 per hour of viewing. I must admit I'm tempted to try. Later in the month A.T.A. hosts new installments of popular series like the music/performance-focuesd Mission Eye & Ear, the kickoff to the Fall calendar for the Other Cinema series curated by the Mission iconoclast Craig Baldwin, an evening devoted to works by Baldwin himself: ¡O No Coronado!, Wild Gunman and Sonic Outlaws (his latest feature Mock Up On Mu is part of the marathon, appropriately scheduled for the witching hour), and a pair of screenings of work by the Mission's twin filmmaker legends, Mike Kuchar and his late brother George. In an article at Eat Drink Films reminiscences about the unique Mission District venue have been collected by that site's new editor, Johnny Ray Huston. My own experiences with the venue date back to my earliest awarenesses of it as the most "beyond punk rock" of all of San Francisco's screening spaces, and along with Aquarius Records and Leather Tongue video (the latter now long-since closed although its iconic sign hangs in Bender's) symbolized Valencia Street for me as a teenager in the early 1990s as the mecca for media that I'd never heard of before and doubted I'd ever be cool enough or smart enough to understand. A part of my cinephilia may be rooted in a quest to unlock the mystique of a place like A.T.A., but I think I've learned that this is probably impossible. A.T.A. boggles the mind of everybody, even the people who are closely involved in its continued operation. With all the changes that Valencia street has gone through in the past 30, 20, ten, five, or even two years, A.T.A. is perhaps the street's most unlikely survivor, and for me its most welcome one. If you can't attend any of the screenings this week or month, please consider donating to an Indiegogo campaign determined to upgrade the venue's technological capacity so it can last for another thirty years. HOW: Scobie notes that tonight "we're screening many different formats from super-8 to VHS, Hi-8, and a hybrid of 35mm slides and digital video. You'll see current works in progress being shown to classic films dating back to the early '90s." I expect Fin de Siècle to screen on digital video.